McCalls 6657: Unlined & lined jacket and coat . 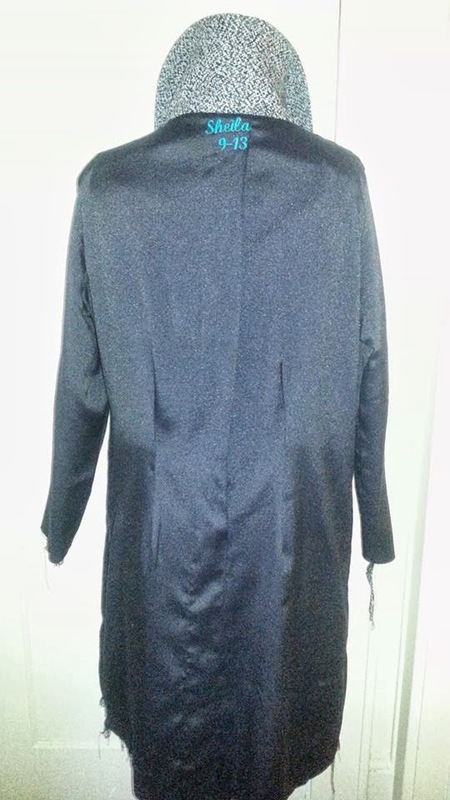 Jacket/coat is loose fitting with long sleeves; Version A, lined jacket with detachable lined collar, button & elastic loop, belt and side pockets. Version B, lined long coat with extended collar, belt and side pockets. Version C: jacket with standard collar, side pockets and optional toggle closures. Version D, hooded with longer hem line in back, patch pockets with optional flap & optional toggle closure. This project started as a muslin for a plaid coat I'd plan on making. However, I quickly detoured realizing the pattern was the perfect blank slate to add some urban flair. I cut version C and used Version D length shortening it above longer back hemline. I purchased the fabric, a black/grey tweed from sav-a-thon (upholstery bin) some time ago during one of their $1.00/yd no-cut sale, which yield 5-1/2 yds. I cut a large according to my measurements and proceeded with tissue fitting and it was too big. Took a closer look at the finished measurements on the pattern piece which yield 47"......yikes. . I checked the sizing increments on the pattern pieces which was 1" increase for the larger sizes and removed 3/4" from the side seams (total 3") and 1/2" from the shoulder seams. Tissue fit again and a lil better, but knew that I would need darts to get a better fit. Cut the fabric and baste the pieces together, pinched out 1/4" for front and back waist darts removing another 2" and added bust darts.... much ... much better... was it the right way... all I can say is it's Sheila's way. I used fusible woven interfacing for all the pieces and incorporated welt pockets which I was sure was going to be a no drama issue. Made several practice welt pockets and was confident that the real ones would be perfect ummm nope, I like to call them smiling pockets. I was inspired by this coat with its vertical strips and incorporated it into my coat, did I know exactly how this was going to play out... of course not, but like the embellishment and went with it. This version does not call for a lining, but included it using the coat pattern pieces, flannel back satin, turquoise piping and coordinating embroidery. Machine stitched the lining at the neckline and hand stitched the remainder. The collar on this coat was huge, I let it sit for a day to figure out how best to tweak it. Went back the next day, laid the fabric pieces onto the collar pattern piece and positioned it 3/4" down from the pattern edge and cut. I have a decent collection of coats (whispering... 23 to be exact) and knew that this latest addition needed to standout among the others. Again, I was inspired by another coat with a dip-dyed detail and ordered several packets of Poly idye from Dharma. Let me tell you....dyeing polyester is not easy, this coat was dip dyed 3 times to get it dark. As the saying goes, the third time's a charm. A co-worker had asked how the coat was coming along and told her for the most part is was nearly done, except for buttons. I showed her the coat and she suggested that I go with snaps, stating that black buttons would be a distraction. I went with heavy gunmetal silver sew-on snaps that I'd purchased from Star Snaps NYC. After dip-dyeing the third time, I decided not to dispose of the dye water. Poor coat has been washed so many times, and lucky that it didn't turn into a toddler's coat... thankful for Oh' faithful polyester. The coat was air dried and the next day revisiting the dye water and a sponge brush in hand, whisked dye along the waist line. It didn't get as dark as I would've liked, but it's there. This coat makes for the perfection addition to my lil collection. With Fall and Winter being my favorite seasons, I enjoy wearing a different coat every other day. However, October temps are hoovering in the high 60s and hitting 72+ around midday, making me a lil testy. Two days last week, the weather was just right for a denim jacket and then the temps perked up and I resorted to suits and cardigans. Over the years, I've become a lil particular about which coats are worn with certain garments. I have coats for various temps, coats just for dresses and skirts, coats for pant suits, coats for just tops & pants, for special occasions and of course, the weekend coats. This coat has not been earmarked for certain garments. I tried it on with slacks and like it and also like it with the dress... but time will tell once cooler temps set in. Hopefully in another week or so, the temps will regulate and I can begin the joy of wearing coats. Until then.... Have a Great Week. Oh man, I love this coat. I was pretty much on board and then I saw the picture after you dyed it, and my interest just flared up. What a great idea! I do have a question. 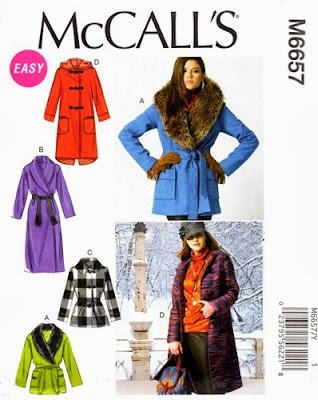 When you are making a coat, do you do any fancy tailoring stuff or just follow the directions on the pattern? I want to make a coat, but I'm not really up to anything super fancy right now. But I want to make sure that whatever I do won't be too flimsy. Beautiful, creative coat. It might actually inspire me to dig out the dark blue, flecked wool I have and unearth the pattern. I am, frankly, afraid of coats. They can go so wrong and look so homemade. Yours is gorgeous and I love the dip dying. This is another awesome post and the coat is gorgeous. I would grab that off a rack in a heartbeat. Again You have outdone Yourself ! Thanks Adelaide. No fancy tailoring over here. For the most part I follow the pattern. Any embellishments I make I incorporate them before sewing it together. The upholstery fabric plus the flannel backed satin is a perfect marriage for a winter coat. If one needs more warmth underlining would do. Since I have coats for colder temos, I didn't bother. Thank you Northlady. Dig out that blue flecked wool and sew it up. Beautiful coat! The pattern images do nothing to encourage possibilities. I'm glad you saw this as a blank slate and chose to do something with it. Your coat is gorgeous and you've inspired me to make another one! Love, love, love the coat! But I especially love the dip dyeing and the extra dye that you added at the waistline. That was inspired. I have quite a few coats too not as many as you do but quite a few. I think it gets cold and then stays cold for so long here that you NEED more than one or two or you'd get bored wearing them during the fall/winter season. 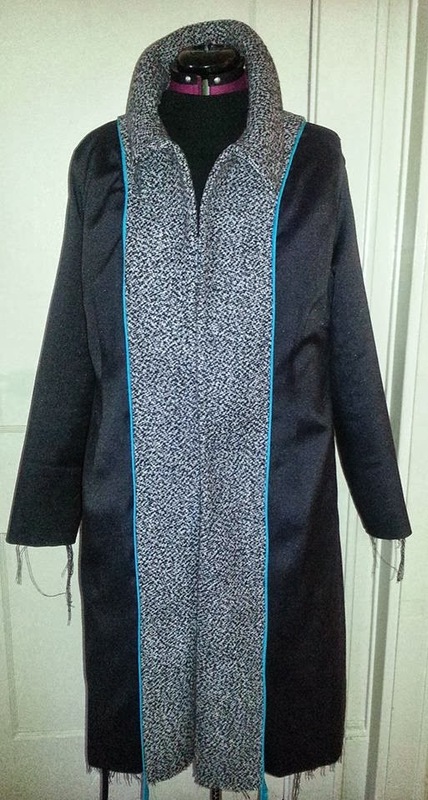 Great job on the coat and I hope I do as good a job with mine! This coat is so amazing, the fabric, trim, lining, your embroidery on the lining and above all the dying process. Fantastic job. Holy moly - that's awesome! I feel like a downright baby now for playing around with Rit in my washer on T-shirt fabric. You're a full-grown woman! Great coat Sheila! I love the Ombré dye affect! Wow! Another winner. I don't know which I love more, the black accents or the dip dyeing. Good job! I saw this on Facebook and immediately loved it. What a great coat. Love, love, love your coat! Love the ombre coat Sheila! Great job! Beautiful coat! Love the ombre effect. Gorgeous coat. Love the ombre effect. Thanks L. I am still swooning over your coat. Thanks Lori. Now if only I could use your quilting skills and incorporate that into another coat. Thanks Sister. I love what you are doing and you have inspired me to pull out my rit dye and some silk. Thanks Myra, I remember the awesome leather jacket you made. Thanks Melodye. Thinking about pulling out some cotton yarn and dyeing for a crochet project. Thanks so much Rhonda. Reading your posts and seeing your fabulous garments are so inspirational. Hi Dawn and Thanks so much. Hi Necie and Thank you. You took an inexpensive piece of fabric and created a beautiful coat. Ver, very nice job! The coat looks great! Love this coat, and your creative details make it special! Your coat is gorgeous! If I didn't know better and saw you in the street I would have swore you bought it from a high end store. The details such as the dip dyed lower half makes this jacket a real standout. I might need to incorporate that into one of my project. it would definetly perk up some ho-hum fabric I have in my stash. Beautiful! I love the dyeing and the piping - both fantastic touches. This is a great coat. They are a signature piece of your wardrobe and this one is tres chic. Congrats on dip dyeing success. What a great coat. I love the idea of dip dying - very chic! What a gorgeous coat Sheila! Thank you so much Lashell and a urge you to definitely incorporate it into one of your projects. Love the coat. Dyeing it was a great effect. Thanks Maria and like the term a signature piece. Thanks Aminat. I was really excited about trying the pipping for the first time. .. Thanks to Carolyn @Diary of a Sewing Fanatic. I love her embellishing techniques. Thanks Shelly. The dip dyeing was trying but glad I did it. How lovely! Great work with the dip dye. Your coat is sooo much prettier than the envelope promises! Hi Sheila. Fabulous, fabulous, fabulous! For some reason I've missed a couple of your posts and I'll figure that out but I'm glad I see this one! You are making me want to make a coat like seriously and I LOVE your plaid fabric. Hi Sewing Diva and Thanks. Go ahead and make a coat, the last one you made was Fierce. WoW, what a lovely, lovely coat!!! The detailing is beautiful and the dip dyeing?!? Amazing. Yikes Sheila, I was on vacation and completely missed your coat! IT IS BEAUTIFUL! What an amazing job! It is amazing how evenly you achieved dying the waist of the coat. I love it! Beautiful coat!!! You wear it well. That coat is BEAUTIFUL!!!!! And you call yourself a beginner????? You LIE!!!!! Gorgeous! Thanks for the Awesome Compliments. The weather is finally beginning to teeter in the low 40s with a midday high of high 50s... squeal. Hey Sheila! I hope you're okay. Miss your posts! The work and talent and great eye for style blew me away. What an amazing coat.